It’s funny the way the mind works. To me, beekeeping is primarily an exercise in observation. One approaches the hive, observing the comings and goings of the bees, noting the particularly strong hives, questioning the less active ones. 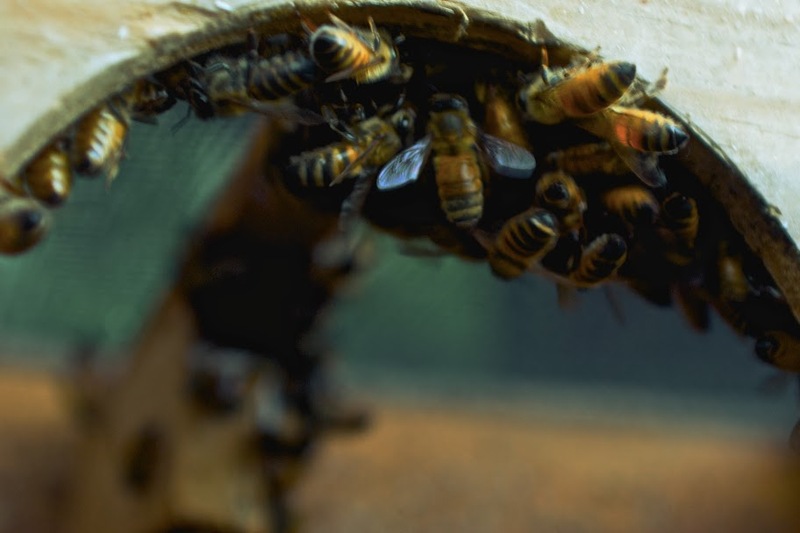 As you come closer, you observe what the bees are doing around the entrance: some are departing, others are fanning, some are coming out to greet those that are returning. Of those that are returning, some have their pollen baskets full and others I assume have their honey-guts filled with nectar. One can just tell, by the power of observation alone, that all is well. As you open the hive, recollections appear of the last time you were here. Maybe the top box is filled with capped honey, when last time is was just beginning to be filled. Moving deeper, one can see where the new brood is being laid by the queen, and the old cells, the ones that were young last time you were there, are turning gray and crinkly, with new life ready to emerge. The weather changes of the last few weeks go through your head, as well as those nearly unconscious observations of what’s blooming in the field. All of these things begin to take shape in the mind and you try to understand the life of your bees. How are they? What’s going on? How can I be of assistance to make their lives fuller? Sometimes you get it right, and sometimes you don’t. But each time you grow a little closer to the bees, and they repay you kindly with stings for your transgressions. When a hive dies, it is particularly hard. You aren’t given the opportunity to make amends. They are gone. No more looking forward to the dandelion bloom, or a Big Leaf Maple with its drooping blossoms filled with bees. Those families of bees, their genetic strengths and weaknesses, all of that which wished to develop through future descendants, are gone. Aristaeus, son of Apollo and the nymph Cyrene, brought the gift of bees down from the mountain for humankind, and I was not prepared for the responsibility. You can only begin again. Thankfully, new families of bees will be available soon, and maybe some will take kindly to us. And maybe I will have learned just enough of helping sustain life to make here their home.